Also, tell the driver I think she's HOT. 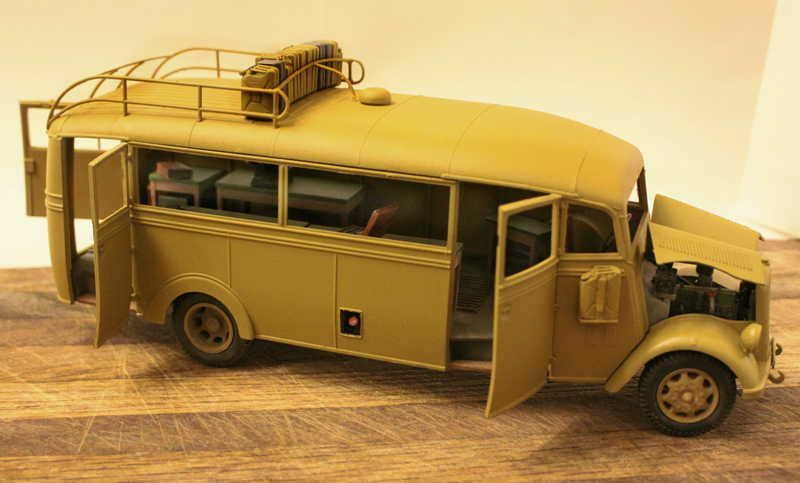 Frenchy, would you have any interior photos of the radio bus? 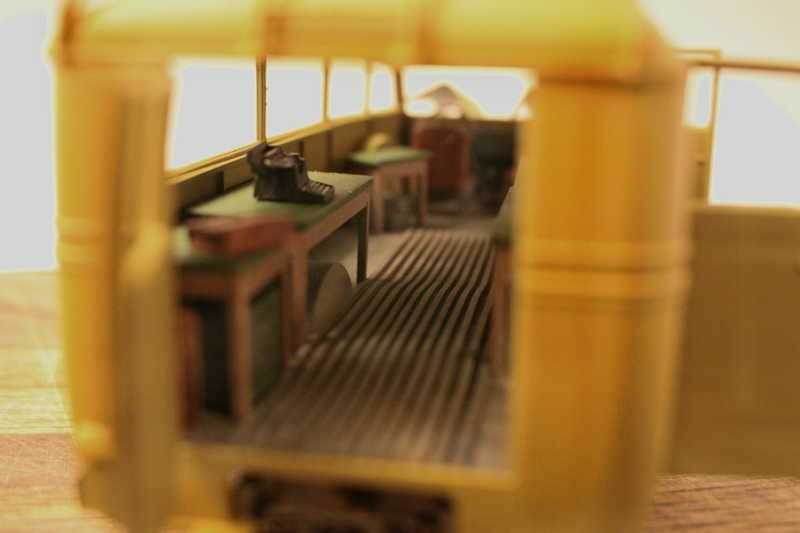 I can find interior pics of other, smaller radio vans but not the omnibus. Angel I failed to compliment you on your hand made copper sheet fenders. Very nice. That you are now going for the dough kneading trailer is just over the top! I love soldering, so never miss an opportunity to tackle with copper or brass. 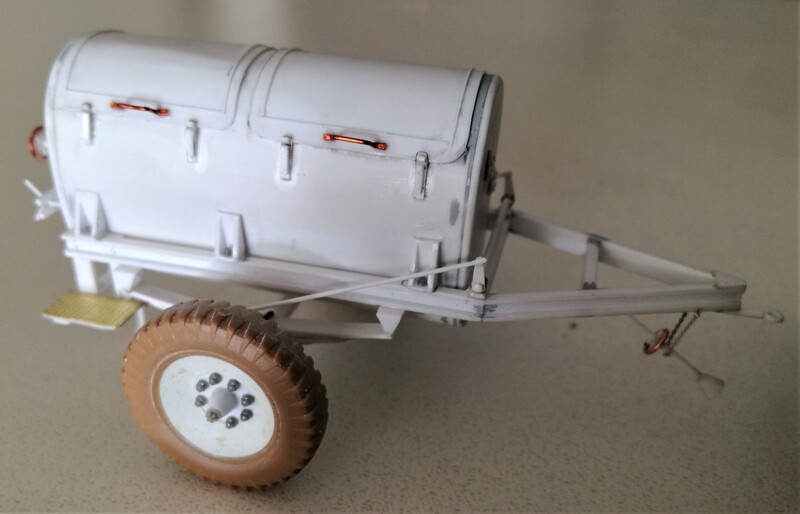 The dough kneading trailer was run by DC electric motor. Some German generators may have also had a direct current winding in the generator. I think portable radio battery charging was DC as that was quicker than AC but I am no expert. 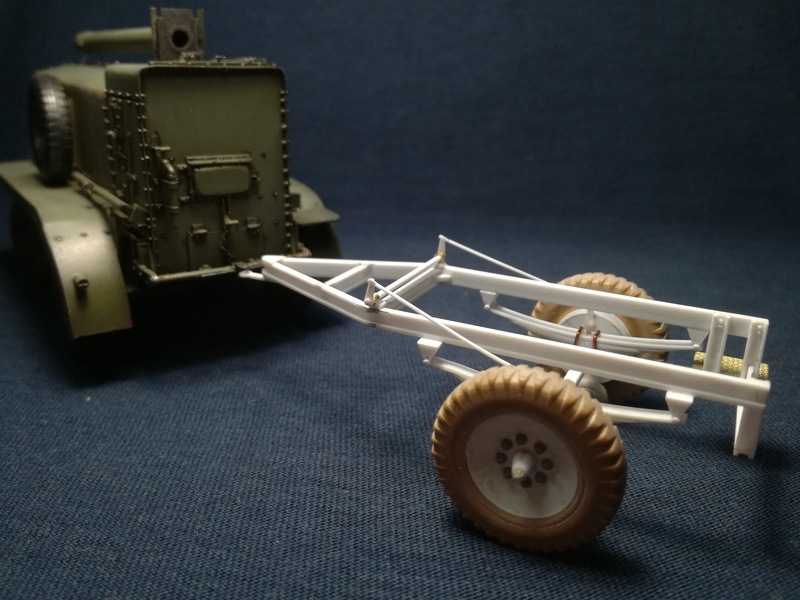 Small update on the Sd.Ah.115 and start of the Büssing NAG 4500 S.
Changed the position off the trailer bed to get it sagged. Hot water didn't work ok. So I made a small cut to fix it. 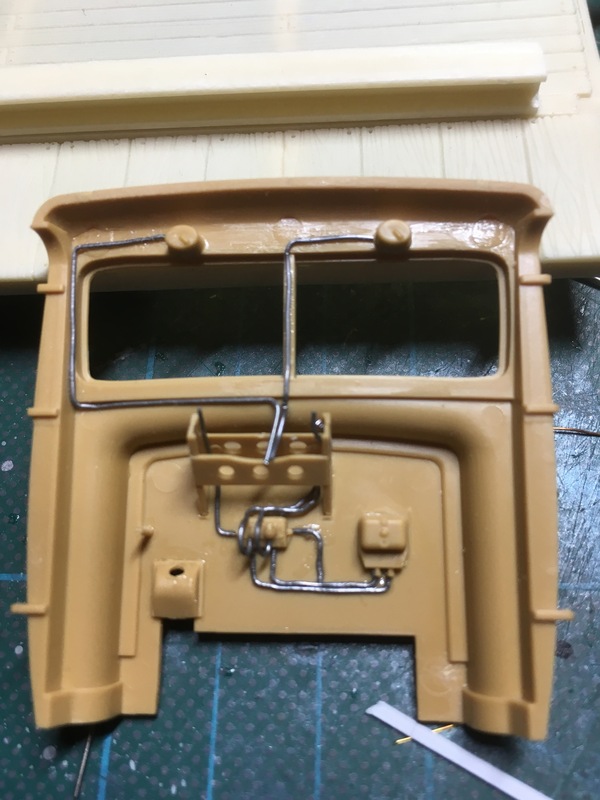 Added some detail like the hooks and the winch. 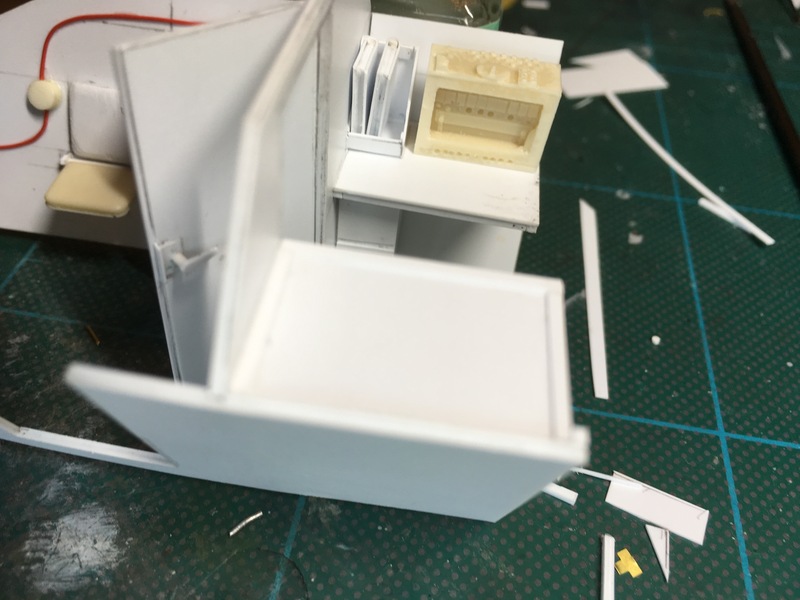 Removed a lot of resin on the sides and got it replaced with styrene. When the trailer gets on it's wheels, truck is needed. 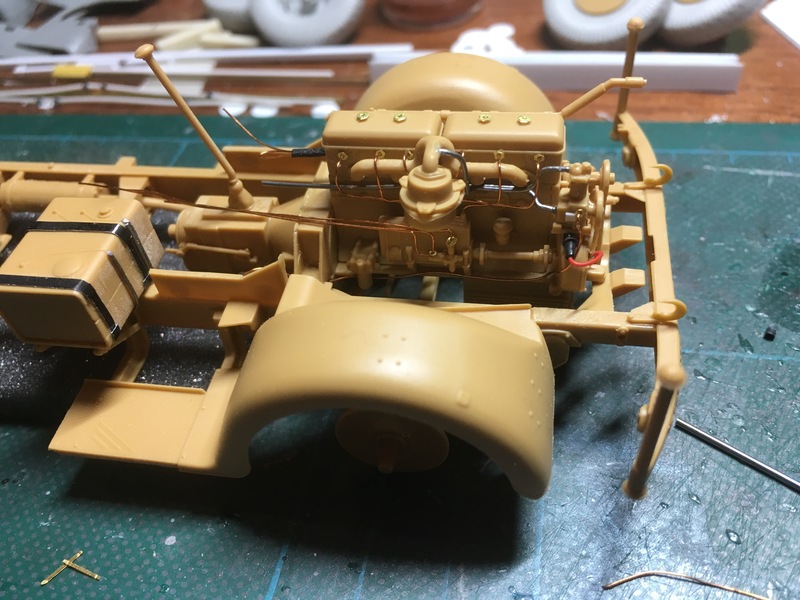 So I started on the Büssing NAG 4500 S. AFV is a lot of detail fun. But leaves some question. Engine is pretty and very well detailed OOTB. But no wiring. 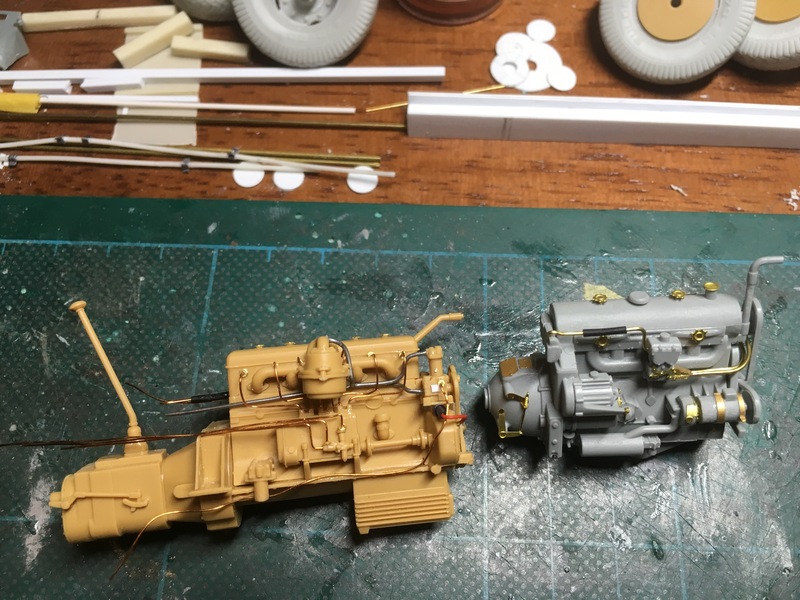 I want to see the engine when finished, so detail added. 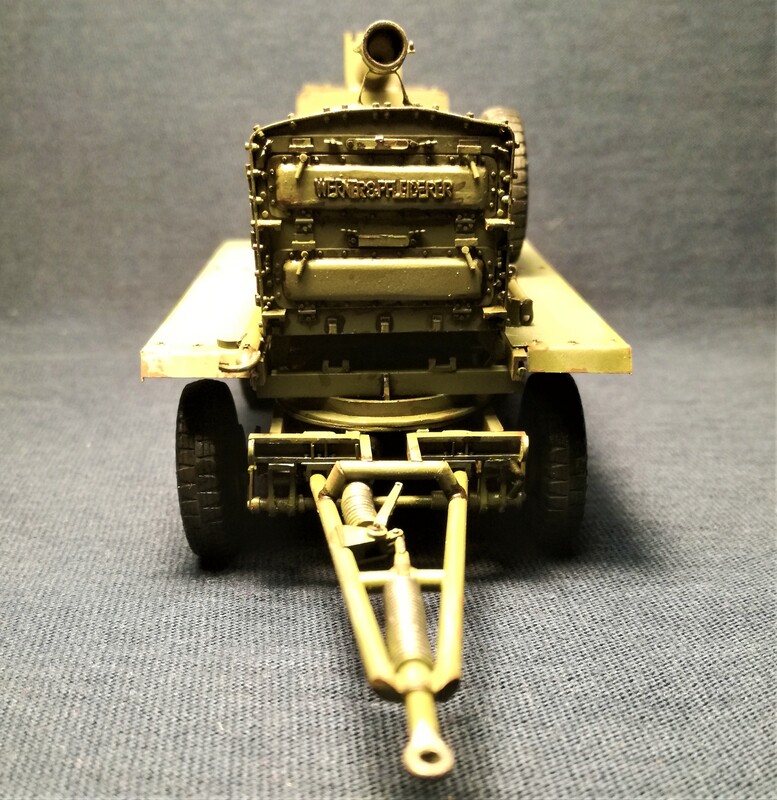 Comparing with a Maybach from the Sd.Kfz.7/3 The Deutz power unit looks massive. 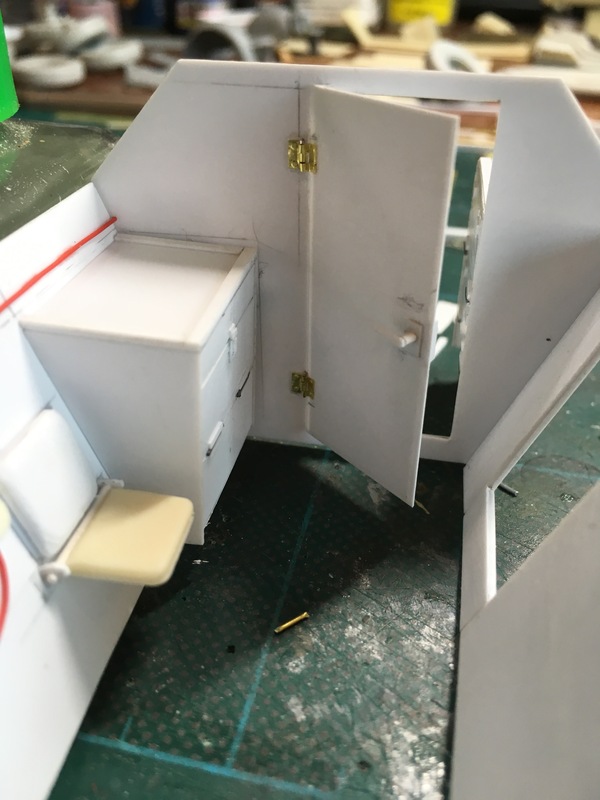 Cabin doors. Lots of work to get that flat. Added some detail on both sides. 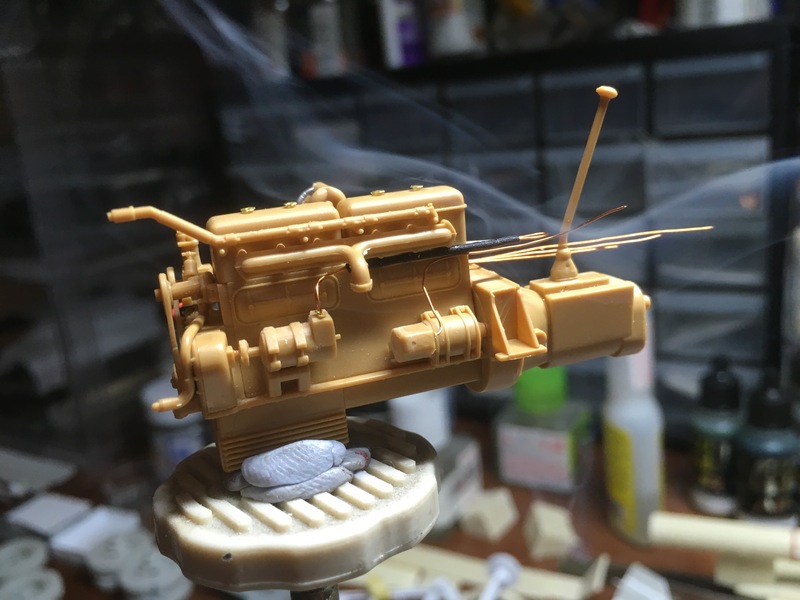 Robert maybe after seeing yours I will start adding engine wiring. If I may ask what is the source of the tiny copper wire you use or do you take apart braded lamp cord for this? p.s. I know the heavier wires are actually made using small diameter solder. I work at TES-AMM Thailand. We recycle a lot IT scrap, dismantle electronic wastes, so there is plenty of wiring in all kinds of diameter and material available. If people are interested I can make sets with different wiring diameters and lots of interesting tubes, very small diameter. Springs you will not believe so tiny and workable. Costs for the materials, no!. Maybe some sharing of plans, other stuff or what ever. Just need your addresses and I can send it to you. 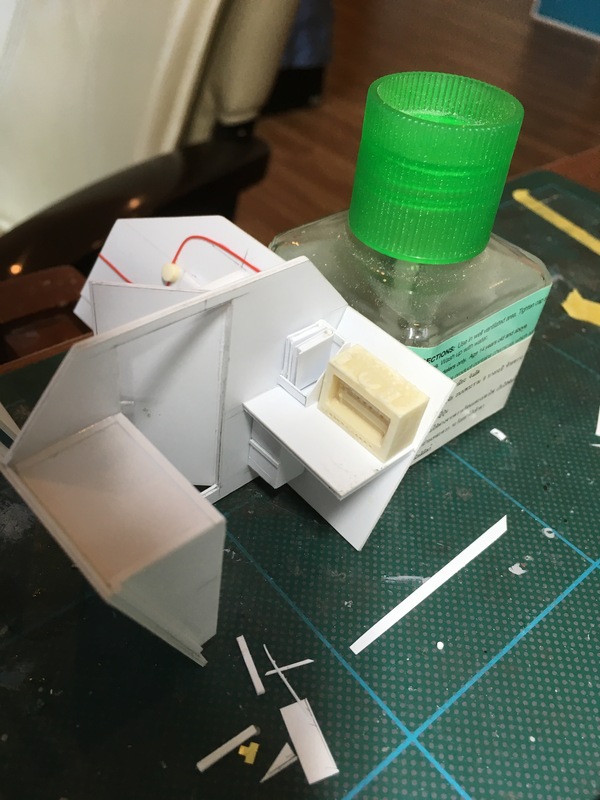 I will make a sample of what is to be expected. Ask the ladies at TES-AMM to sort some materials. HI Guys - Me too! 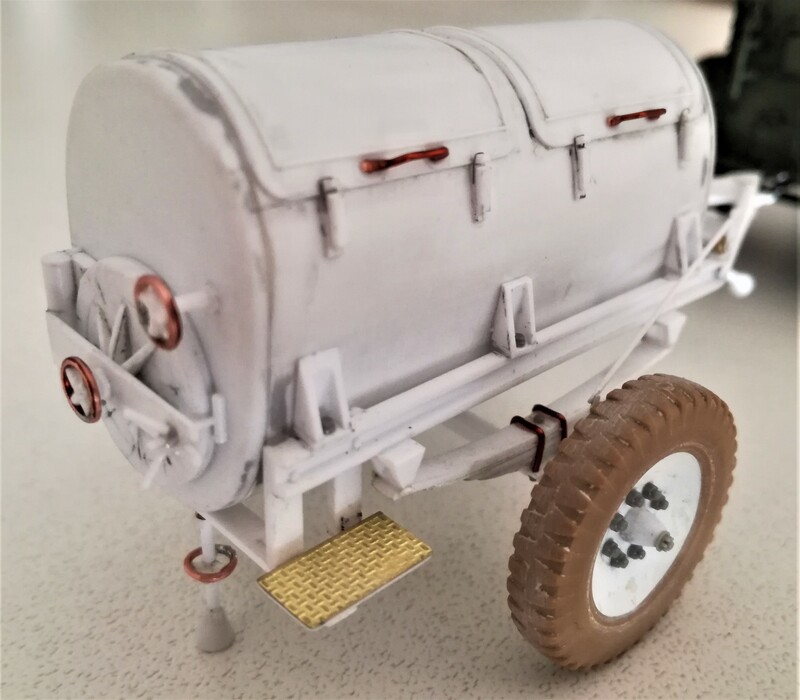 Robert - very nice work on that truck and trailer - funny, with all the detail it looks a bit like monochrome images of a restoration! - and, yes, I too would like to find out more about the detail parts you might have access too - I find myself repurposing stuff all the time! Hi Angel - wow! the trailer(s) is/are looking great - and man, you seem to build pretty fast too - very nice to see! 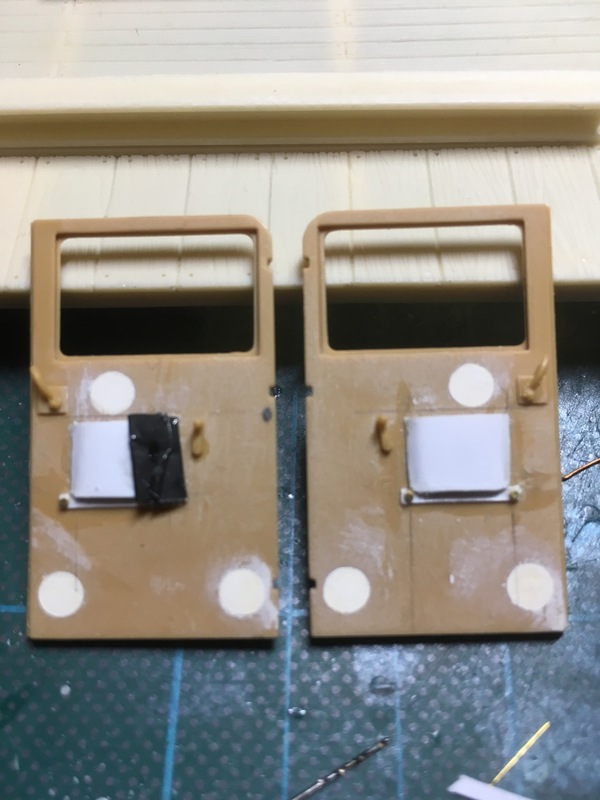 Below, the parting shots of my updated HMMWV - I am a bit surprised that there isn't a kit of this somewhere? the front bumper and rear bedwalls are distinctive and not at all like their predecessors...and I think it looks pretty interesting. And there you have it! yes...there are a few odds and ends to fix - but, mostly done! and...I must have broken the taller antenna, and each of the forward grenade launcher off at least four times along the way!! 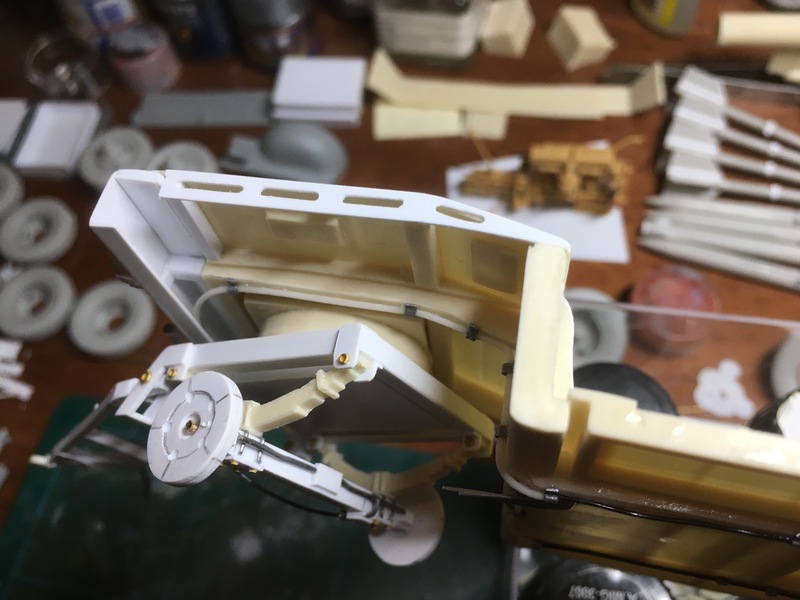 Ok - while not exactly a scratch or conversion, certainly a modification or two under way for this T55 AMV....some etch from Eduard and Aber (the Aber stuf btw - is something else - VERY small and pretty nice - very tedious!!!) 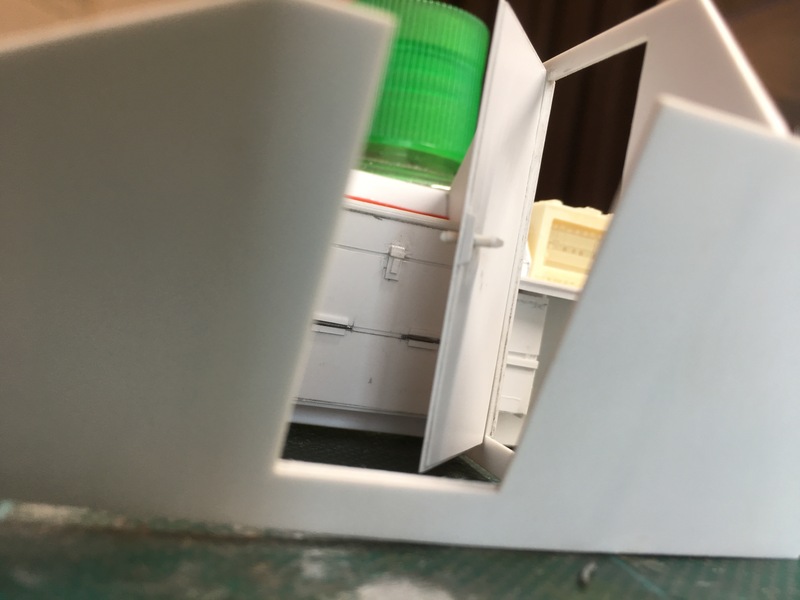 and many unseen scratch built elements used to hold it all together. The plan was to build it OOB, but no way - too many fun things to try! Nick with all that PE, added wires/hoses and all that battle damage (nothing looks more like thin bent metal than thin bent metal) I have no problems with it at all! I was concerned more that you guys might think I was taking advantage showing my Blitz radio bus???? Still not exactly sure that qualified for this thread. 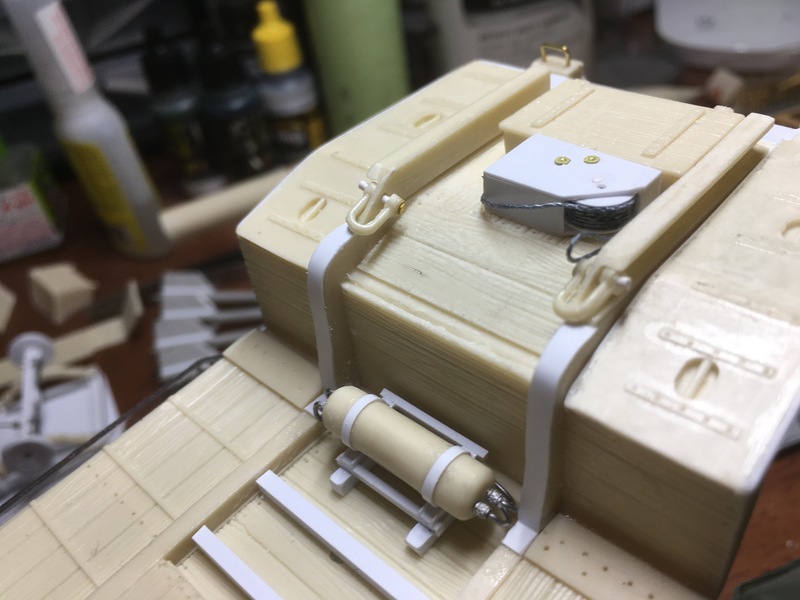 Those are some excellent builds Nick, one question though, is that a large seam on that T-55 fuel barrel? Hi John - glad you like the builds, thanks! And, YES that is a big ugly seam...oh, don't worry, you you can only see it every time you look at it (hahaha)! Yes, it is a seam and I knew about it before...but, I got so carried away with the etch etc that I forgot to patch it...nice eh? good job me(!? )...so, a not at all subtle, and obvious ugly gap (yes, embarrassed!!) will get some putty and sanding! 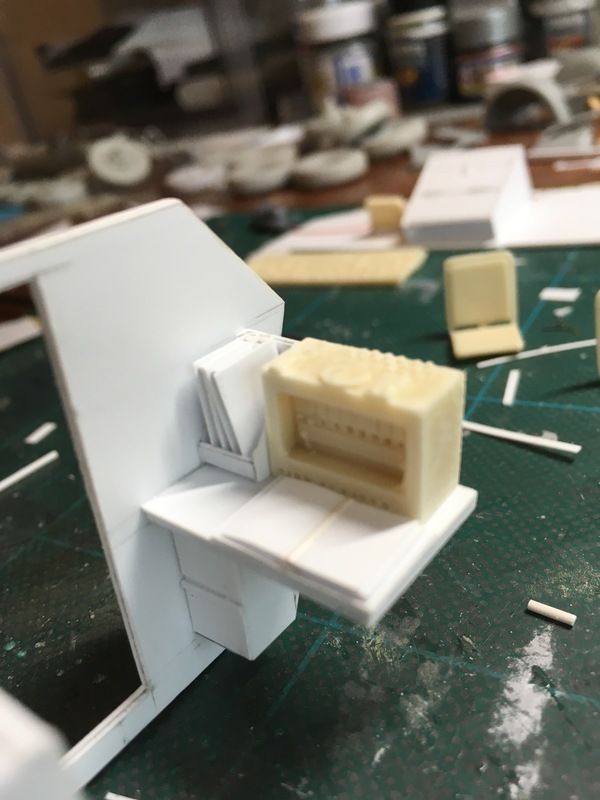 pretty funny - considering the time I've put into very small and tedious details on this build...(there are a total of 24 tiny, vertically placed louvers individually glued on to the back vents! !....one by one....) I do "mind the gap" and I will fill it! Nick, that really is one loaded down vehicle! 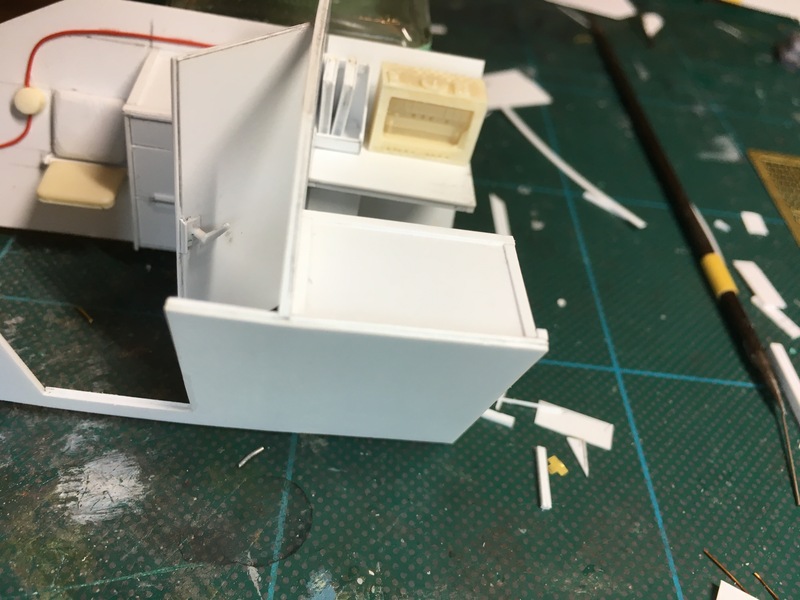 Had a week away from modelling and I see so much progress on your builds, guys. Robert, your work on that monster trailer is simply brilliant! Nick, I'll repeat myself, but you have produced a real stunner!!! 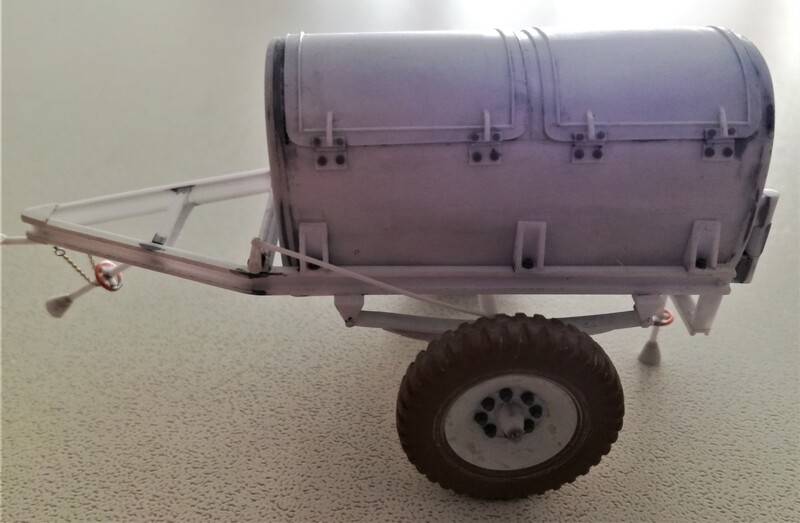 It's almost ready for painting-once I add the hand brake and check for some other minor details. Please let me know what you might find out about the generator that would be proper to match with this. I know a bit about the larger German generator trailers but little about the smaller one and two man carry generators that would load in the back of a truck. 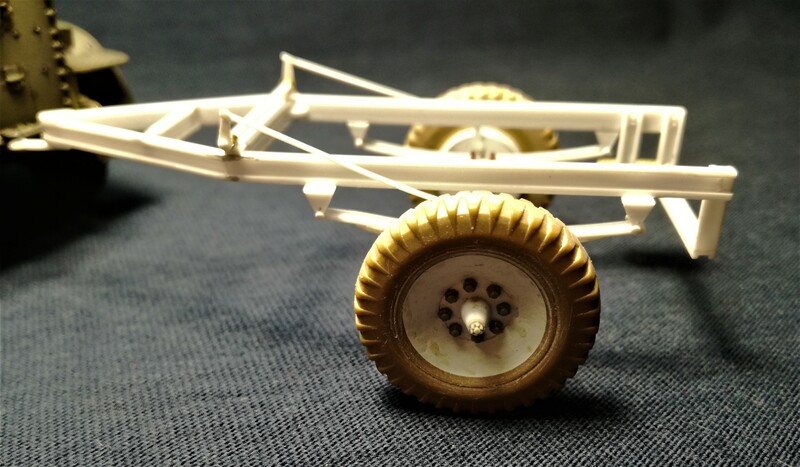 I did not care for the "added on, last minute" look of the extra long roof rack. I therefore left off the additional raised wood deck extension and shortened the fencing around the rack. Nice work guys. About the generator. 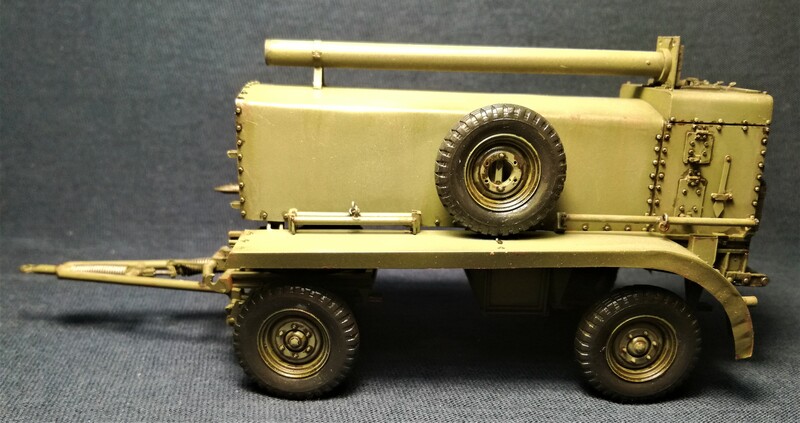 I saw a picture of a Zündapp generator by Lead Warrior. Look a light weight power unit to me. This 7,5 kVA field electric generator (Stromaggregat) was widely used in german army during WWII. It was to deliver 3-phase 380/220 V, 11.4 A current to power up any kind of field installations - command, medical and radio posts, camps, workshops etc. Thanks to its reliability and automated control system, this particular generator was also widely used as a backup power unit in the industrial or civilian facilities, such as factory lines, hospitals, bomb bunkers and alike. Despite its quite high power of 7,5 kVa, this generator had reasonable weight of about 300 Kg., so it could be handled by four men (four foldable handles were provided for that). Ones unloaded from a truck or a trailer, this device was very compact. The Zundapp KS600 (model 1938) motorcycle 2- stroke, 2-cylinder, 28 hp, air-cooled engine was utilized to rotate 3-phase generator and the centrifugal fan, which was inclosed in the shell cover to deliver airflow to the cylinders. The Solex carburettor was controlled by the pneumo-hydraulic automatics for optimal fuel consumption. Mike, this KOM is shaping up nicely! My web research on Maschinensatz 220 V, 6.5 kW als Anhänger fahrbar did not bring much.I found info on its dedicated Dienstvorschrift (D 399), which unfortunately is available only in German libraries. 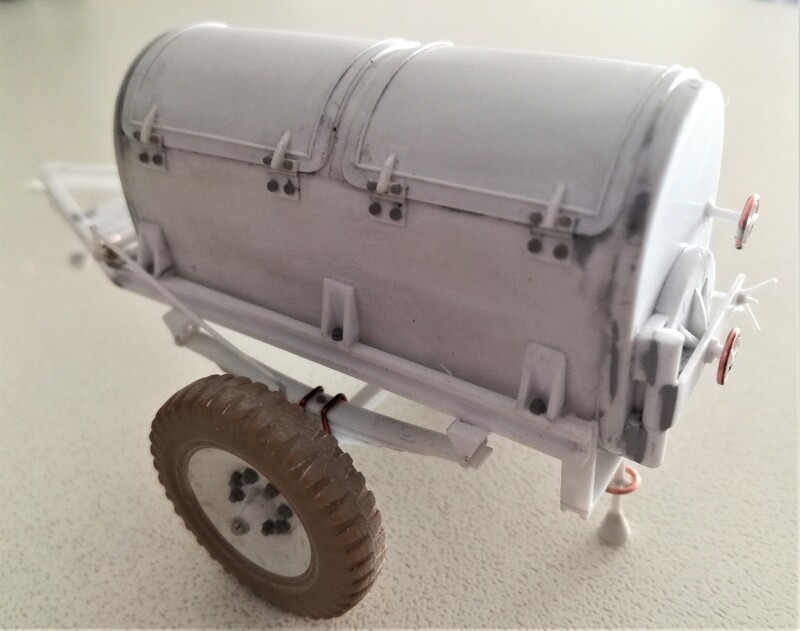 -it made sense to use DC for the Dough Kneading Trailer because DC motors allow a better control of revolution speed and start easily under load. -220 V DC is nightmare for transportation-it requires very thick power lines and suffers considerable power loss.Therefore I assume the 220V in the generator designation relays to the voltage of AC generated, which is transformed to lower AC voltage that is later rectified to DC within the generator housing.In other words-an AC generator that has built-in converter to DC. I already started a discussion with some modelling buddies in Sofia and hope to find more this Thursday evening, when I'll meet some knowledgeable people. 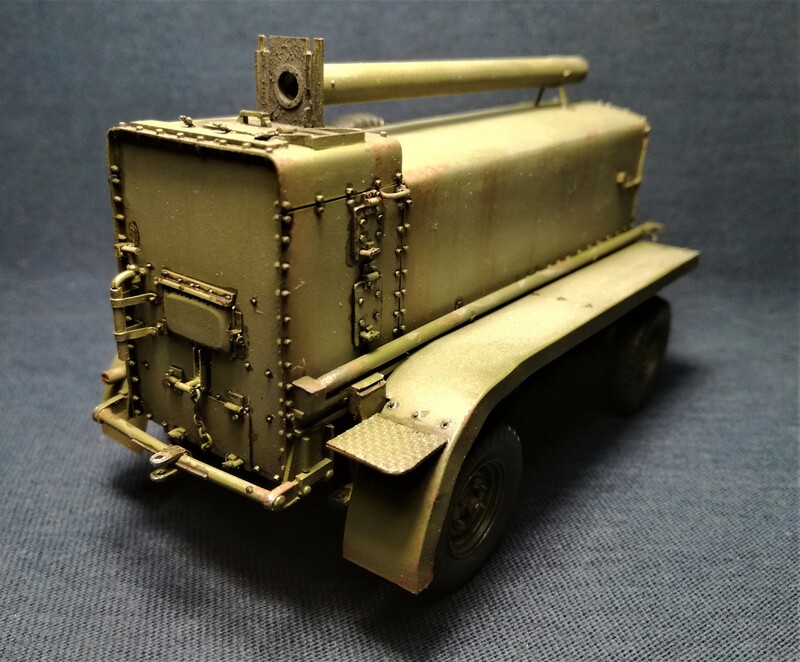 With regard to the smaller Wehrmachts generators- besides LW offering that Robert posted, there is also a plastic kit in 1/35th scale of Riich Models-German Antenna Set & Generator GG400 (#RE30014). Besides different antenaes it offers 2 generators. Hi. Notice that when you enter the site of Lead Warrior you can download all instructions of the models they offer. 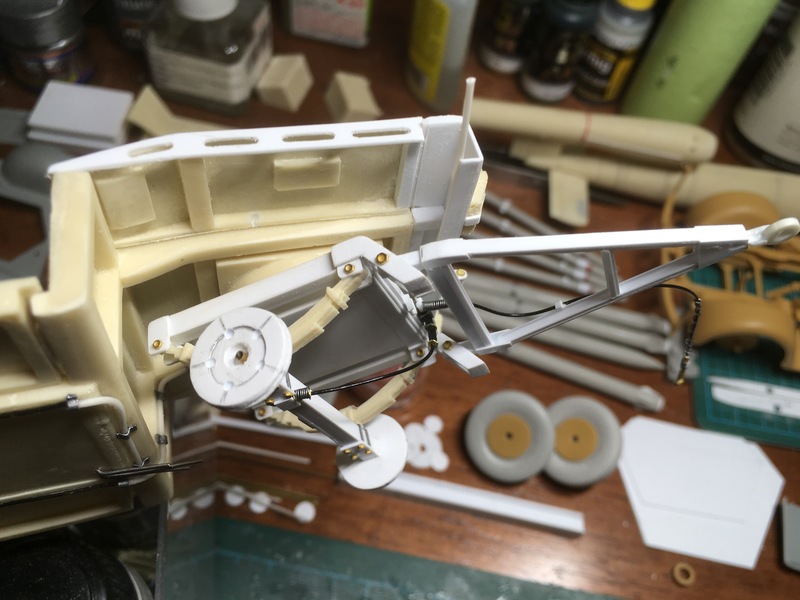 Already use one exploded view for scratch building the Feuerleit Panzer. The lead Warrior kit, i have been searching for, is hard to get. Wonder if it is still in production. Based on the Dragon Sd.Kfz. 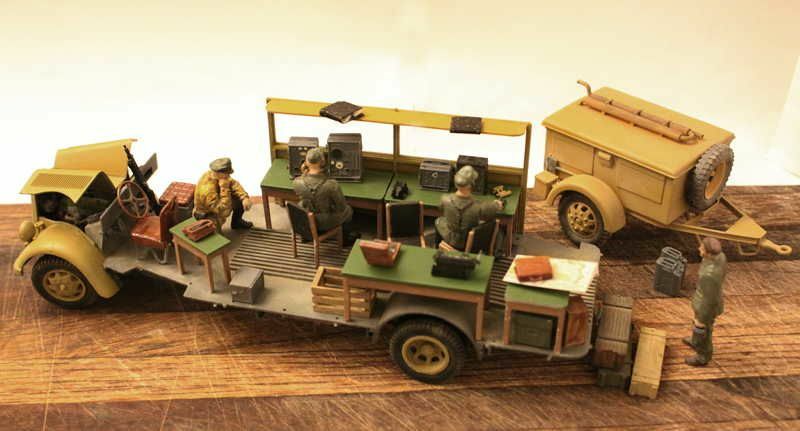 7 one can build the "Mobile Bunker" what the Feuerleit Panzer actually is. Started some weeks ago with basic shapes. 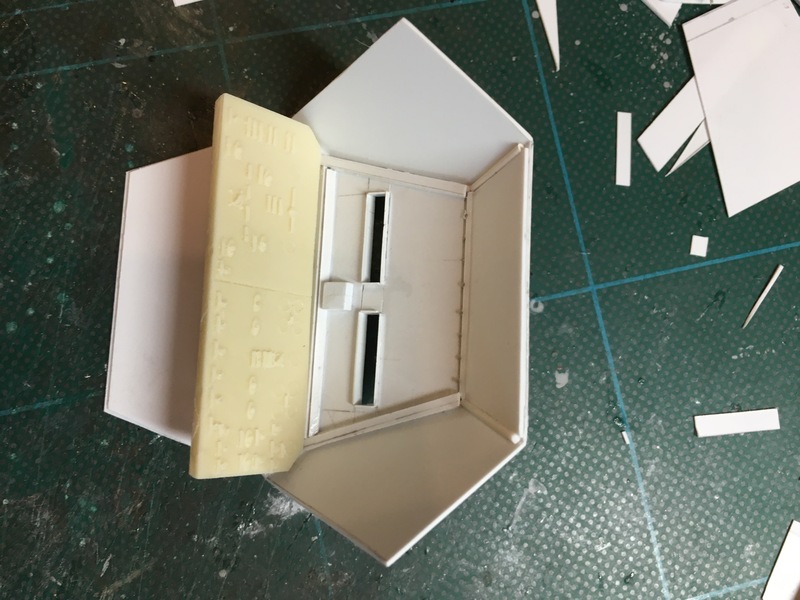 Figured out how panels are constructed and started working it out in styrene. 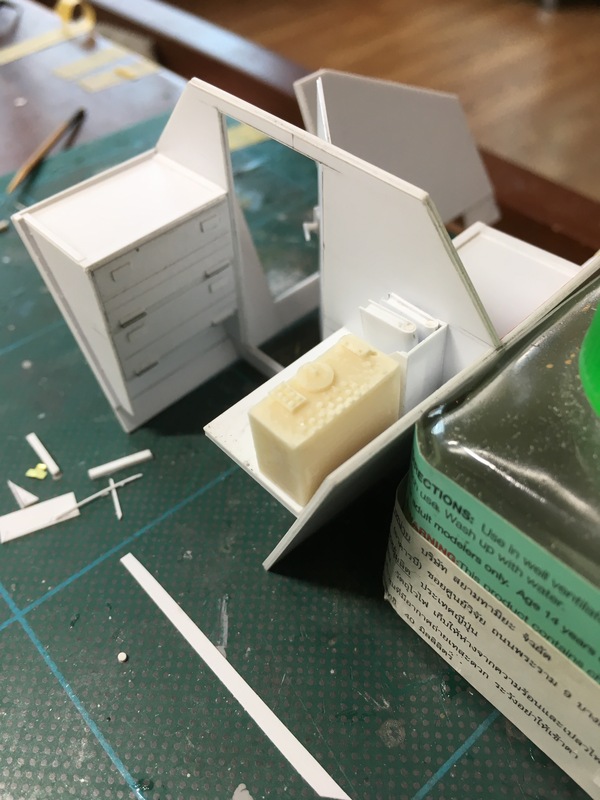 I'm using the resin kit from Custom Scale for comparison. Some details are actually useful. Switch / control panel is very nice. Radio is another thing I can live with. Except for the seats, rest is very bad casting. To get the shape of the 'Panzer' is more complicated than I would have expected. I had to make a start and results are satisfying so far. About the wires and detail stuff, please have some patience. 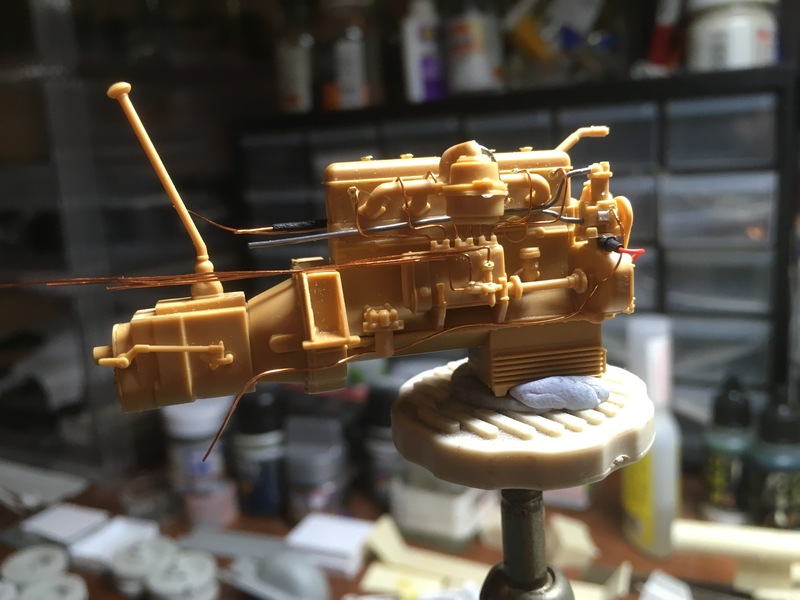 Recently bought a house (last week), so I was rather busy with other things than hobby. But don't worry, ladies are aware and collect.